Traditional Tongue and Grooved Strip Flooring comes in a variety of sizes and timbers. Strip flooring can be laid over bearers and joists, existing timber flooring, particleboard, concrete over battens or plywood. Timber flooring in known for its natural beauty, in Australia we are fortunate to have so many quality hardwoods available. These include blackbutt, spotted gum, brushbox, jarrah, tallowwood, grey iron bark and numerous others. There are two traditional sizes of Strip flooring the 80mm x 19mm board, which is secretly nailed to the subfloor and the 130mm x 19mm board, which is top nailed to give greater stability to the wider board. The majority of timbers come in three grades, Select, Standard, and Feature. Select grade has minimal degree of natural feature in the boards. 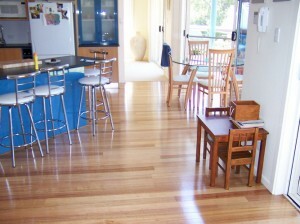 As a naturally occurring product, all timber flooring contains some degree of natural features. Standard grade relates to a moderately featured board. Flooring in this grade contains a regulated degree of feature, experiencing a greater degree of natural faults. These features will not only be greater in quantity than select grade, but are also larger in size. Many clients prefer this grade as they feel its gives that natural look to the product. Feature grade has a very high degree of these natural faults and provides a very rustic appearance. With today’s technology in kiln dried timer products there is also a range of hardwood flooring up to 180mm wide. For more information on these products please contact our experienced sales team. Please have a look at our Strip Flooring Gallery.